In Portland, we have a wonderful store, if you adore paper arts and letterpress. It’s called Oblation Paper and Press. 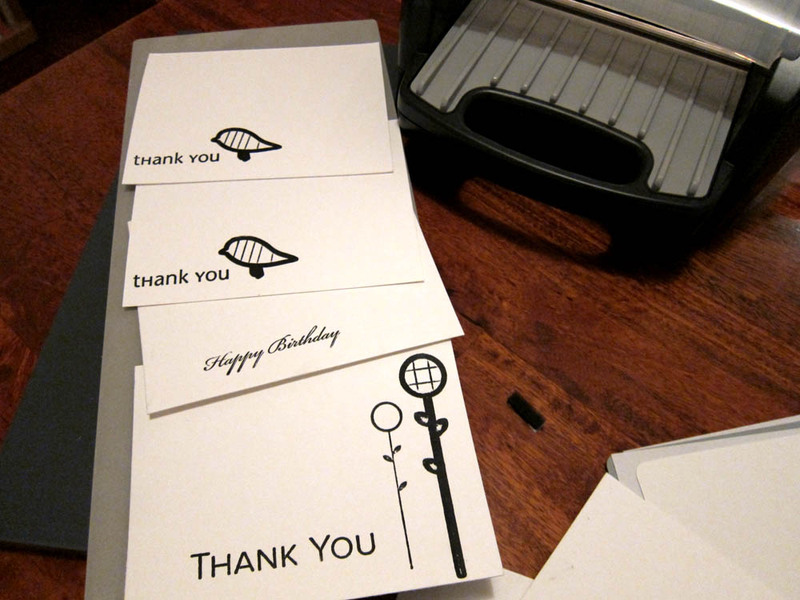 I was lucky enough to take a letterpress class there a while ago, working with those incredible old machines and wooden letter blocks (I made a postcard-sized thank you card that said “Danke”). Anyhow, our current downsized lifestyle, which I adore, does not really include room for a turn-of-the-century, gigantic, zillion pound letterpress machine! (Maybe when the Zs depart…) So, I didn’t think playing with letterpress would be in my future. Then, Tom gifted me with the crafter-sized QuicKutz Epic 6 letterpress and die cutter this Christmas. Before even using it, I have to say that I enjoyed reading all of the reviews. I traveled back in time, via the Interwebs, to the moment of its launch to see what reactions were when it first came out. The outraged posts on the part of professional letterpress artists about this innocuous little machine surprised the heck out of me. I am not sure what they found so threatening. I would think it would only expand people’s appreciation for, and understanding of, this incredible art. When I took my class at Oblation, the pros had to use a ton of tricks and tweaks to get great results. Every machine had its own personality. Don’t expect home letterpress to be any different. There are some good posts about modifying the machine, and about other’s experiences with it, including this one from Boxcar, here from Paper Crave, and lastly Viva la Blogette’s review. Mine own first pass reactions after spending a few hours with the machine several weeks ago are below. Above is a photo of some of the results I got with the Epic 6 during that time. I was able to get passable results pretty quickly out of the box, particularly with the finer letters and lines. The plates that are included are uber low quality. When I opened the box, several of the stock images were dramatically warped and completely unusable. The brayer that was included worked fine for me, particularly on narrow text. In fact, for this, I preferred it to the fancier 6″ one I purchased on the recommendations above. I am curious to order plates from Boxcar though, and use the larger brayer with some guides. This will be the key to good results with larger inked areas, which are hard to coat evenly with the smaller brayer. I had no problem with cracking plates, as others did. But, I didn’t print any large runs. Also, I didn’t press boundaries in terms of increasing the impression depth. Watching a video or two beforehand is definitely helpful. You will definitely want more color than the solo black tube included with the kit, so buy an array of ink ahead of time if you can! Make sure you have lots of time to play the first time you take it out of the box. It’s addictive! This entry was posted on Sunday, February 12th, 2012 at 1:36 am. You can follow any responses to this entry through the RSS 2.0 feed. You can leave a response, or trackback from your own site.